The Family Holiday Association is delighted to be partnering with online booking specialist, eviivo, for National B&B week taking place from 18th -24th March. The week will celebrate and raise awareness of the hard work of the British independent accommodation sector and follows the success of the inaugural National B&B Day in 2018. This year, founders eviivo and the B&B Association, are joining forces with the broader travel industry and are encouraging B&B owners to offer guests exclusive extra perks. From discounts on a stay, to luxury chocolates, champagne on arrival or afternoon tea, the hope is that this will encourage as many holidaymakers as possible to book a room and take a break. 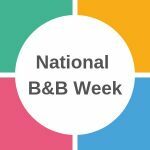 To support our charity, B&B owners are being invited to offer two-night stays in their accommodation to struggling families during National B&B Week and beyond. They also have the option to add a new booking mechanic to their website which will allow their customers to donate £1 when they confirm their stay.